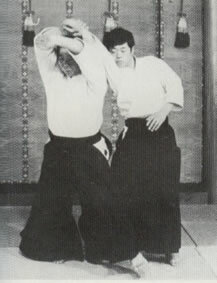 Ikkyo means first technique. So what is the meaning of performing Ikkyo? Or more correctly, teaching your partner (on whom you are performing the technique) to raise their arm by constant repetition and stretching. Most beginners when asked to raise their arms up (over their heads) bend the elbows. This problem is quickly cured if practising to raise up the arms when holding a katana (sword) as they will strike themselves in the head with the tsuba (guard) if the arms are too bent. I have my students perform this motion over and over again, whenever and wherever they can, as part of their small stick practice. If you tense the arm to put power into it, you quickly find that the stick is on a collision course with your head. A good reason to relax the shoulders and let the hand raise up. Because this relaxed extension of the arm is not an instinctive movement, I believe that one of the reasons then to practice ikkyo is to form your partners arm into the “right” shape so that they will eventually develop the kinaesthetic appreciation of the form. My teacher, Takayasu Sensei shihan, advises that ikkyo, nikyo and sankyo are fundamental development forms and that O’Sensei had famously said that: “if you are able to perform ikkyo, nikkyo and sankyo perfectly, then I will grant you the 3rd degree black belt“. *This beautiful woodblock print “One Hundred Aspects of the Moon: Gojo Bridge Moon” was a personal gift from Sensei Ann Reekie of the Canberra Dojo. It shows the fateful meeting of the warrior-monk Musashibo Benkei and Minamoto no Yoshitsune on Gojo Bridge in Kyoto and is by the famous woodblock artist, Tsukioka Yoshitoshi. 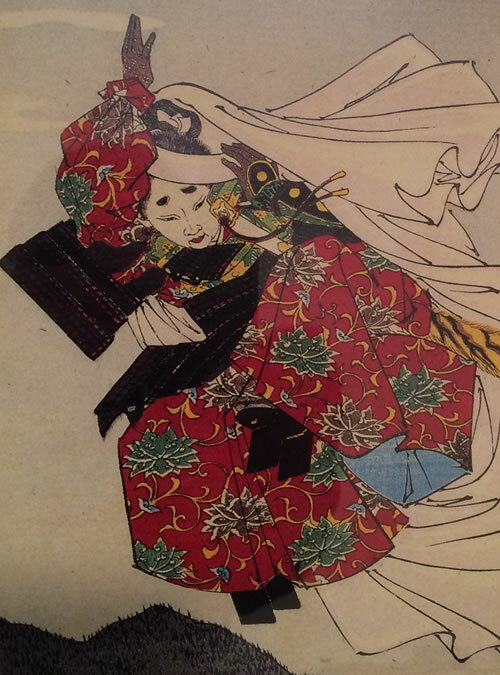 The picture shows the moment when Yoshitsune leaps through the air to to avoid the blow from Benkei’s staff and who then distracts his opponent by throwing his iron fan (tessan) at Benkei’s head. There are two variations of ki-no-nagare. Do not let attacker turn in ii-no-nagare. Step toe to toe – this footwork is the basis of all urawaza. I am posting information here for my students. My reflections, rememberances and research. © 2019 Aikido Australia All Rights Reserved.